Oscar Romero was the Archbishop of San Salvador from 1977 until he was assassinated in 1980. He was initially regarded as a conservative choice as archbishop, but he became increasingly outspoken about human rights violations in El Salvador – particularly after the murder of his close friend Father Rutilio Grande in March 1977. 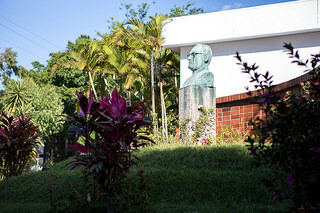 During his three years as archbishop, Romero repeatedly denounced violence and spoke out on behalf of the victims of the civil war. In a time of heavy press censorship, his weekly radio broadcasts were often the only way people could find out the truth about the atrocities that were happening in their country. He defended the right of the poor to demand political change, a stance which made him a troublesome adversary for the country’s rulers. Why is he an important figure to commemorate? Archbishop Romero was one of one of the most remarkable figures of the 20th Century, who deserves to be commemorated alongside the likes of Martin Luther King and Mahatma Gandhi as a peacemaker who sacrificed his life standing up to injustice. The world today desperately needs more figures like Romero – leaders with the courage, faith and love to stand up for the poor against injustice. Romero is, in particular, an inspirational figure to hundreds of millions of Catholics around the world. He didn’t simply talk about the need to love your neighbour, but courageously named the injustices that plagued his country. He reminded us that Christ is found in people living in poverty, and that we cannot ignore the suffering of our brothers and sisters in need. We can all celebrate Romero’s legacy by following his example: by challenging injustice wherever we see it and by refusing to stay silent about the issues that keep people in poverty. For example, climate change is the single biggest threat to reducing poverty in the world today. What does it mean that Romero being beatified – and when it is happening? Beatification, or declaring a person “blessed”, is the necessary prelude to full sainthood. In February 2015 the Pope announced that Romero died as a martyr, opening the path to his beatification. The Pope’s proclamation followed a vote by theologians at the Vatican’s Congregation for the Causes of Saints in January that Romero was killed in “hatred of the faith”. Unlike other candidates for beatification, people who have been killed in hatred of the faith can be beatified without having a miracle attributed to them. The Vatican has announced that Romero will be beatified in El Salvador on 23rd May 2015. There is also no set date for Romero’s canonisation – the final stage of the process, when he will be declared a saint. What is Romero’s link to Caritas? In the 1970s, CAFOD (Caritas member in England and Wales) supported Romero’s famous radio broadcasts, which – at a time when the press was heavily censored – were often the only means by which people in El Salvador knew the truth about the atrocities occurring in their country. When Romero’s radio station was blown up, CAFOD provided funding to rebuild it. CAFOD also helped to fund the support given by the Church to thousands of people who had fled their homes because of the violence. After Romero was martyred, CAFOD staff successfully petitioned Lambeth Council to rename the Brixton street where their office was located ‘Romero Close’. And when CAFOD moved to a new office in 2009, it was named ‘Romero House’. CAFOD staff, partners and supporters have been at the forefront of the campaign to have Romero beatified, and continue to be inspired by his work. Around the world CAFOD works with Church leaders and other partners who speak out against the injustices in their countries. In the UK, CAFOD supporters are currently campaigning on the injustice created by climate change – which is the single biggest threat to reducing poverty in the world today. What is the situation in El Salvador today? From 1980 to 1992, El Salvador suffered a violent civil war, in which about 70,000 people were killed. Inequality between the rich and the poor was one of the root causes of the war. Most Salvadorans lived in extreme poverty while a small number of families controlled much of the wealth and political power. Today, El Salvador is a more democratic country, and it is likely that Romero would be pleased to see some of what is happening there. In 2013, one socially-minded government peacefully succeeded another, and they are consciously trying to implement policies that Romero would approve of: fiscal reform, free school uniforms and books for children, funding for cooperatives, more social programmes. However, El Salvador remains a country in the grip of inequality, and there remain serious problems related to gang violence and organised crime along with the ongoing threat of earthquakes, devastating floods and hurricanes. What does Caritas do in El Salvador today?